Unagi is the Japanese word for freshwater eel. Due to the dangers associated with eating raw freshwater fish, unagi is always consumed cooked, usually barbequed and covered with a sweet sake sauce. Due to the increase in popularity of sushi in North America and the world, many non-Japanese consumers have acquired a taste for this exotic food. Bbq eel is also commonly consumed in Italy on some special holidays, but cooked differently, not as unagi. Most of the unagi consumed in North America is farm-raised, usually in China. Young eels are collected from the wild, usually from rivers in Maine, and then sold and raised in Chinese farms. Unagi is then imported and sold already cooked and covered with the sauce, vacuum-packed and frozen. All you need to do is thaw it, slice it against the grain, warm it up a little bit and serve it in your favorite recipe. Warming the unagi is very important, because it enhances the flavor tremendously by melting the layer of fat that is under the skin. However, don't warm it too much because the unagi may start falling apart due to its tenderness. The picture above is of unagi nigiri. This is my favorite way of having unagi. A more traditional way to serve the bbq eel in Japan is the donburi dish or also called chirashi. Basically, it is a bowl of rice topped with unagi. 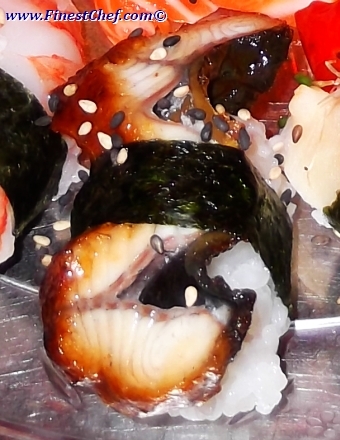 Another common sushi with eel is the unagi roll, which is made of slices of unagi and cucumber. I used to also add avocado to it. Due to perceived or real shortages during the past two years, the price of unagi has increased significantly, and unless somehow they manage to breed them in captivity, I don't see the price coming down anytime soon. For about 16 unagi nigiri pieces as the one from the picture you will need 1/2 pound of bbq eel, 16 strips of nori, 1 cup uncooked sushi rice, 1 cup cold water, 1 tbsp. rice vinegar, 1 tsp. sugar and a little bit if wasabi. Recipe: Wash the rice thoroughly and cook it with the water in a rice cooker or in a small pot, without lifting the lid until it is ready. Let the rice stand for 10 minutes, then mix it with the rice vinegar and sugar. Let the sushi rice stand again at room temperature for 20 minutes more and then form the thumb-shaped rice balls. Apply a little wasabi on top of each rice ball and place the unagi slices over them. Secure each sushi with a strip of nori and serve with soy sauce, pickled sushi ginger and wasabi. Sprinkle the unagi sushi with some toasted sesame seeds if desired. When buying unagi kabayaki, you would do yourself a big favor if you take a few seconds to look into the ingredients. A good unagi should not contain msg, and a lot of the bbq eel on the market does contain it. About the author: George Krumov is a Red Seal certified chef with many years of culinary experience working around the world in Europe, the Middle East, the cruise line industry and North America. In the last decade he has headed the kitchens of several restaurants in Canada, and ran his own restaurant.